With six moisturizing oils packed into a funky little pouch, Hello Hair’s Hydrating Mask makes deep-treating your mane manageable — no messy oil blending necessary. This Australian-made hydrating mask — Island Escape edition, of course — smells like a fresh piña colada and makes your hair feel silky to the touch. The deeply nourishing oil treatment repairs and revitalizes summer-scorched (or color-scorched!) hair, temporarily binding split ends (get those trimmed, please) and giving the hair and overall touchably soft look. Applied to dry hair, Hello Hair’s Hydrating Mask quickly absorbs and drenches each delicate strand with mega moisture; this is thanks to coconut oil, which is incredible at helping hair retain hydration. After my first treatment, I noticed how soft, smooth and manageable my hair was. It responded well to styling products, but kept that sleek look without a weighted-down feeling. I couldn’t stop touching my hair! The ingredients blend — anchored by coconut, olive and grapeseed — gives Hello Hair’s Hydrating Mask the perfect texture and weight. When I’ve oil-treated my hair with straight coconut oil, it’s been a pain to remove, leaving my hair either 1) extremely oily post-wash or 2) extremely stripped from over-washing to removed said oil. I didn’t experience any of that with Hello Hair’s Hydrating Mask (and remember, I’m heavy-handed when it comes to beauty treatments!). Everything washed out easily, yet my hair was left with a wonderful sheen and softness. BONUS: Hello Hair Hydrating Mask Island Escape Edition is NUT-FREE in case you are allergic! RANT: The full ingredients are not listed online! This is a major pet peeve of mine. While the key ingredients are listed, the grapefruit, glycerine and lime are not. I don’t understand why, so Hello Hair, can you please fix that? END RANT. Besides the actual ingredients inside Hello Hair’s Hydrating Mask, I love the bright, fun and functional packaging. The screw-top nozzle on the side makes applying oil directly to your scalp very easy, or you squeeze the perfect amount of oil directly into your hand. The pouch packaging makes it easy to store — it doesn’t take up much space! — and an ideal candidate for keeping in the shower, since clumsy Kim over here is notorious for dropping glass (!) bottles in the bath. Within this seemingly small pouch (about 3.5 ounces) is several hair treatments. If you have medium-length hair like I do, you can probably get five or six treatments out of this pouch, depending on how generous you are with your pours. Overall, I think Hello Hair’s Hydrating Mask is a great purchase. I love the packaging and ingredients, and while they aren’t certified organic, I’m not a purist —but wouldn’t it be cool to see certified organic in this little pouch? I think Hello Hair’s Hydrating Mask would make a lovely gift, too, especially for someone new to hair oils or green beauty. 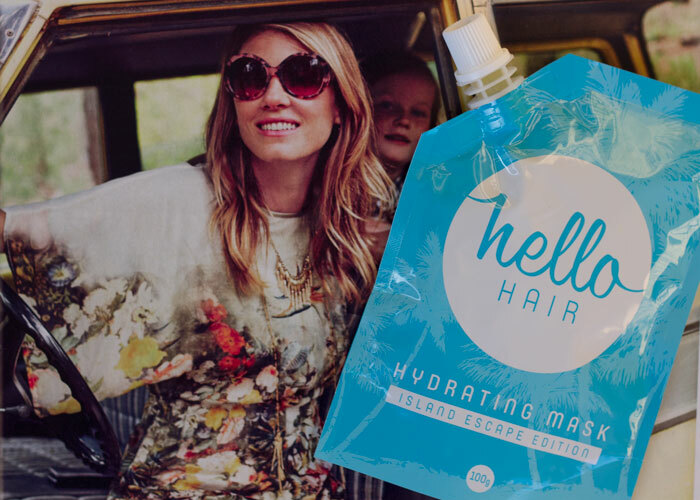 Have you tried Hello Hair Hydrating Mask? What are your favorite hair oils? Do you even do hair oil treatments or nah? Tell me in the comments section!